Aluminum heat sink extrusions, also referred to as sunflower aluminum extrusion, are more and more widely used in areas of mechanics, automobile, wind power, engineer, locomotive and household appliances etc. Based on good properties of aluminum sheet, heat sink extrusions boast excellent features. First, they give attractive look. Aluminum sheets have been anodized before being processed into heat sink extrusions, which makes it easy for the latter to be coated with various protective colors. Second, they are lighter than heat sink plates of other metals. Aluminum proves to be the slightest metal because of its small density. That is one of the key reasons why it has won so much popularity and become an ideal substitute for steel in countless areas, including heat sink extrusions. Third, they show better heat dispersion property. It has been proved that less aluminum plates are needed than steel ones if installed in a same room for the same warming effect. Therefore, aluminum heat sink extrusions are more energy-saving. Fourth, they are of excellent corrosion resistance and wear resistance. Owing to its strong activity, aluminum element reacts easily to oxygen in the air and the two produce aluminum oxide which is known of good anti-rust property. The corrosion resistance ability of aluminum products gets strengthened greatly after surface treatment of anodization. 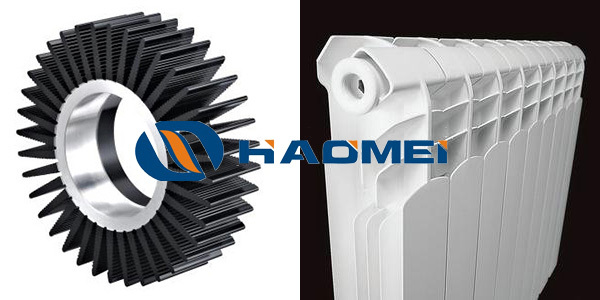 Haomei Aluminum manufactures aluminum profiles for making heat sink extrusions of various specifications. Welcome to contact us at april@aluminumhm.com, leave a message below or wechat/whatsapp 008615838029491 for more information.